All of our guests use these pipes every day. Have a shower, brush your teeth, rinse a coffee cup, or just plain flush that toilet – just about whatever you do here at the motel creates a micro flood that needs somewhere to go. It goes out the gate, down the lateral (the pipes that take wastewater from houses to the main in the street) and into the sewer main! However, the sewer main, and the laterals for that matter, are pretty much buggered after the quakes and so it’s time for a replacement. Over the next year just about every sewer pipe in the city centre is due to be replaced and starting today it’s our turn! Over the next 2 months the sewer pipes from Salisbury St. to 1/2 way to Bealey Ave are going to be replaced. It will be a slow moving sewer procession of dig up, remove, replace and cover up. This and the extra road works that are ramping up will provide plenty of challenges over the next few months but we hope our guests are able to see the good side of it all. All day today a long procession of trucks delivered gazoodles of stuff for the repairs! The truck can sit there for a long time cos the road is already blocked off on our side for cars but ok for pedestrians. 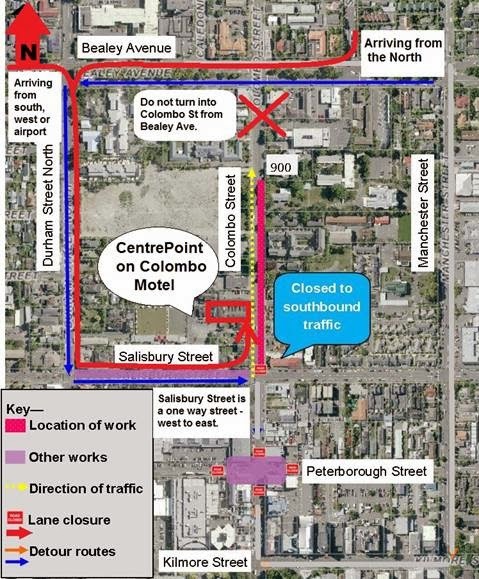 Back a week or so ago, the original explanation was that Colombo St. traffic would be one lane, north to south. We were sending out emails telling future guests of the change when the phone rang and Fletcher said they’d be round with some more info. As it turns out, there is a water pipe in the way on the other side so now Colombo St. will be one way, south to north. 80% of our guests arrive from the north so having that entrance option blocked off is one of the most inconvenient things that could happen. But we roll with the punches and so remade the detour map and started sending it out again. How to get to the motel over the next 2 months. It will be an interesting 2 months. We are once again in a cul-de-sac, amongst a myriad of road works. We’ll give up on any chance of a drive in (will tell you all if we get one!) and just hope our booked in guests do manage to get to us without too much stress. Getting ready to dig up the road, an underground check revealed we have all our basic services right at the motel entrance! We have; pwr – 11kv of electricity, Enable – fibre optic cables, T/com – phones, H20 – water and GAS! How colourful!! Over the next 2 months we’ll provide vivid updates as the sewer procession proceeds. Hopefully we’ll be able to provide some interesting info about sewer, and lateral repairs, some funny stories about just what is happening and a few extras along the way! !